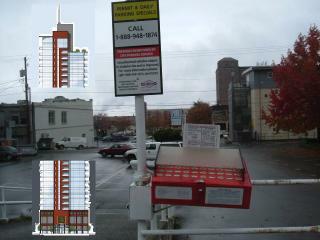 Editorials from Theslowlane: 20 Story Building Planned For Downtown Bellingham. Bayview Tower. 20 Story Building Planned For Downtown Bellingham. Bayview Tower. Picture is a collage I pasted from photo of the site in it's current state and an image of the proposed building from October 20 Bellingham Herald. It's okay with me. I look forward to watching construction. It's density, in filling and so forth. You've probably heard the arguments for density versus sprawl already. I am sure some folks will be a bit rattled at the prospect of a 20 story building in Bellingham. Same paper spoke of two 18 story proposals for the old Morse Hardware site down State Street from this location. Basically all condominiums. Some office and retail space as well. I do worry about over population as a world problem. All those families, I see at places like the Bellingham Food Co-op; with baby strollers. The people are coming. And the money is coming too. Quite a few retired folks are bringing their "home equity" to Bellingham. Building up, instead of out, is better. Problem is we are likely to be building both up and out. That's what seems to usually happen. One thing that will result is Bellingham getting a more urban skyline. For folks that are worried about growth, that could be a blessing in disguise. Some of the flow of recent transplants is people trying to escape cities. Part of that flow might think twice about moving near a city with a skyline. A lot of sprawl is driven by hoards of folks wanting to move into rural settings. So, the prospect of a 20 story building can be kind of exciting. I do hope the city and developers plan things well. One thing I look for is a building "giving back" something to the community. Not all just private spaces that most of us can't afford. Tall buildings often provide things like observation decks that are open to the public for at least an affordable fee. One great example of that is the Smith Tower observation deck in downtown Seattle. What new restaurants might be coming to town? Hope they aren't too snooty. I forgot to say, that new Bellingham building will be called Bay View Tower. My guess would be that the old mines are being taken into account. Pilings could be placed around them. I haven't heard anything in the media about that yet. I do remember the mines being an issue when they built the 40 (aprox.) unit apartment building at Railroad and Holly; (where Starbucks is). If I remember correctly, they mapped out two mines going different directions under that site according to a Herald article. Interesting: Bellingham has mines under parts of the city, but they aren't necessarily impossible to work around. Bay View Tower has a web site up with more pictures, details and space for community comment.